The Mississippi River delta is a rich ecosystem of barrier islands, estuaries, and wetlands that's home to a diverse mix of wildlife—as well as more than 2 million people. Over the past few decades, the shape of the delta has changed significantly, as ocean waves have carved away at the coastline, submerging and shrinking habitats. To keep flooding at bay, engineers have erected dams and levees along the river. However, it's unclear how such protective measures will affect the shape of the river delta, and its communities, over time. Now researchers from MIT and the Woods Hole Oceanographic Institution (WHOI) have devised a simple way to predict a river delta's shape, given two competing factors: its river's force in depositing sediment into the ocean, and ocean waves' strength in pushing that sediment back along the coast. Depending on the balance of the two, the coastline of a river delta may take on a smooth "cuspate" shape, or a more pointed "crenulated" outline, resembling a bird's foot. The new metric may help engineers determine how the shape of a delta, such as the Mississippi's, may shift in response to engineered structures such as dams and levees, and environmental changes, such as hurricane activity and sea-level rise. Jaap Nienhuis, a graduate student in the MIT-WHOI Joint Program in Marine Geology and Geophysics, says the effects of climate change, and the human efforts to combat these effects, are already making an impact on river deltas around the world. "Because there are so many people living on a river delta, you want to know what its morphology or shape will look like in the future," Nienhuis says. "For the Mississippi, the river supplies a lot of sediment. But because there are a lot of dams on the Mississippi nowadays, there is not as much sand coming down the river, so people are very worried about how this delta will evolve, especially with sea-level rise, over the coming centuries." Nienhuis, and Andrew Ashton and Liviu Glosan of WHOI, report their results in the journal Geology. Over hundreds of thousands of years, a river's sand and silt flow toward the coast, ultimately piling up at a river's mouth in the form of a low-lying delta. A delta's coastline can be relatively smooth, with most sand depositing from the main river, or it can fan out in the shape of a bird's foot, as the river bifurcates into tributaries and channels, each of which deposits sand in finger-like projections. Scientists often characterize a delta as either river-dominated or wave-dominated. In a wave-dominated delta, such as the Nile River delta in Egypt, incoming ocean waves are stronger than the river's flow. As a result, waves push outflowing sediment back along the coast, effectively smoothing the coastline. 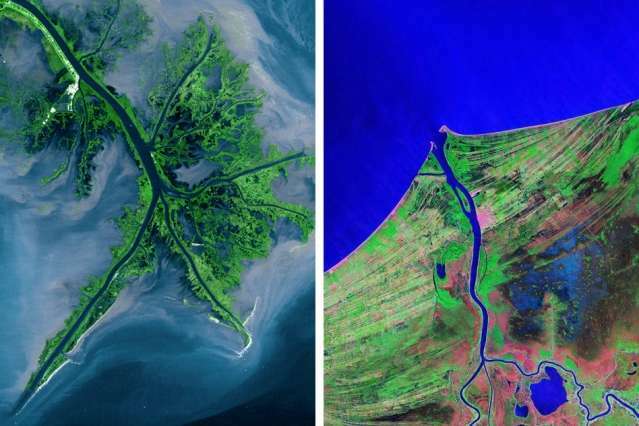 By contrast, a river-dominated delta, such as the Mississippi's, is shaped by a stronger river, which deposits sand faster than ocean waves can push back, creating a crenulated coastline. While this relationship between rivers and ocean waves is generally understood, Nienhuis says there is no formal way to determine when a delta will tip toward a smooth or pointy shape. The researchers came up with a simple ratio to predict a delta's shape, based on a river's sediment flux, or the flow rate of sediment through a river, and the strength of ocean waves, determined by a wave's height, frequency, and angle of approach. Based on the various factors that determine the overall ratio, the team determined the point at which a delta would no longer be a smooth outline, shaped by ocean waves, but instead, a pointy coastline, influenced more by the river. "At some point there's so much sediment that you exceed the maximum of what waves can do," Nienhuis says, "and then you become a 'bird foot,' or river-dominated delta, because the river is so much stronger." Nienhuis and his colleagues applied the new method to 25 river deltas on the north shore of the Indonesian island of Java, a region where sediments have deposited on a shallow continental shelf, creating a wide variety of delta shapes. For each delta, the team used a global wave model developed by the National Oceanic and Atmospheric Administration to determine the height, frequency, and direction of each incoming wave. The researchers also used a model to determine the corresponding river's sediment flux. Using data from both models, Nienhuis determined the ratio of river-to-ocean wave strength for each delta, and found that those deltas with a ratio greater than or equal to 1 were more likely to have multiple river channels, with deltas that project out from the shoreline. The main factor determining this transition turned out to be the angle at which ocean waves generally approach the coast: If the angle of approach is 45 degrees or greater, then ocean waves are no longer able to smooth out the amount of sediment coming from a river, tipping a delta's shape toward a river-dominated morphology. Nienhuis says the group's method may help engineers predict the shape a delta may take if erected dams or levees change a river's sediment flow. Similarly, the method may estimate the evolution of deltas with climate change, as rising sea levels and increased hurricane activity will likely alter the behavior and magnitude of ocean waves. Douglas Edmonds, an assistant professor of geological sciences at Indiana University who was not involved in the research, says the new model "is a powerful advance, because it allows engineers and environmental managers to make informed predictions about how to restore deltas that are drowning. For example, in places like coastal Louisiana, substantial funds are needed to divert water and sediment from rivers into drowning areas to build new deltaic land. To make sure these diversions are successful, we need to predict how that new deltaic land will evolve. Nienhuis et al. have provided an important blueprint toward that end."